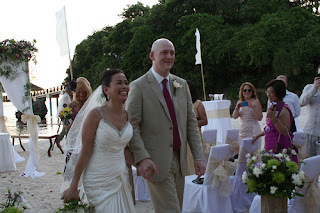 The main purpose of our trip to The Philippines was to attend the wedding of our friend's Carol and Giles. The wedding took place on the beach at the exclusive Shangri-la hotel and was one of the most beautiful ceremonies I have ever been to. It was relaxed, special and had the glorious benefit of the beautifully calm sea and setting sun. The previous night we attended a pre-wedding rehearsal and beach BBQ. The food here was the best I had during my trip to the Philippines, with the notable exception of the superb Nanay Dano's Bistek. If you think the stereotype exists about Asian people and taking pictures is remotely true, you really ought to meet Asian wedding photographers. A short photoset of photos from the wedding is contained within another blog post, click here. I would like to wish Carol and Giles all the very best and future happiness.